I’ve finished my second post Sewing for Handwovens class project. Using one of the Style Arc patterns I bought. I made it in calico first, which I’m glad I did as the instructions are a bit scant in places so I was able to work it out without risking the small amount of handwoven fabric I had. I’d done so because I suspected the collar would be in contact with my skin, and being sensitive to wool that would force me to wear a high collar underneath. I was right, so I made the collar from the lining instead. Though I used interfacing, the only black I had was a bit thin and the collar could be a bit stiffer. I should have doubled it or bought a thicker one. But the collar hasn’t come out too floppy, just a bit softer than it’s meant to be, so I’m not unhappy with the result. 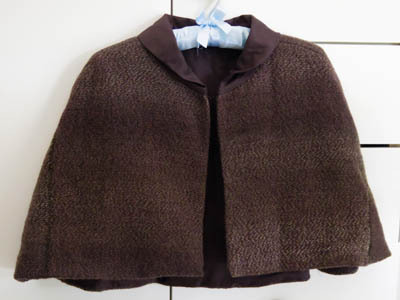 It’s made from the fabric from the Handspun, Handwoven, Handsewn Jacket, which was already the third garment the main yarn in this had been made into. The only change I’m thinking of making now is to put trim along the lines where I pieced together the handwoven fabric strips. I’ll do that if I happen across the perfect trim. In the meantime, I’ll call the Greta Cape done! 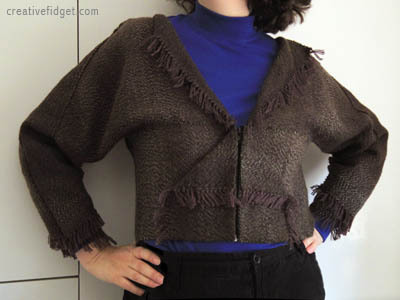 This entry was posted in sewing & refashioning, weaving by chocolatetrudi. Bookmark the permalink.